Circuit schematic like in Figure 1 above is Circuit Schematic Three Phase Brushless Motor Driver using TC4469 IC. The main component in this circuit consist of transistor 2N5550 that used to drive low active for IC4469. This transistor will work like switch on/off according input condition. When input is low it will make transistor turn off (switch off) and when input high it will make transistor turn on (switch on). The next component in this circuit is TC4469 IC. This IC is the family of four-output CMOS buffer/drivers are an expansion from our earlier single- and dual-output drivers. Each driver has been equipped with a two-input logic gate for added flexibility. The TC446X drivers can source up to 250 mA into loads referenced to ground. Heavily loaded clock lines, coaxial cables, and piezoelectric transducers can all be easily driven with the 446X series drivers. The only limitation on loading is that total power dissipation in the IC must be kept within the power dissipation limits of the package. The TC446X series will not latch under any conditions within their power and voltage ratings. They are not subject to damage when up to 5V of noise spiking (either polarity) occurs on the ground line. They can accept up to half an amp of inductive kickback current (either polarity) into their outputs without damage or logic upset. In addition, all terminals are protected against ESD to at least 2000V. Output of IC TC4469 will drive two kinds of MOSFET, these are IRFZ40 and IRF4905. The gate current for a IRZ40 will be less than 0.25mA. When the gate voltage is 3v to 4v higher than the source, it turns on and the resistance between source and drain terminals is about 0.028 ohms. It will handle up to 35 amps. 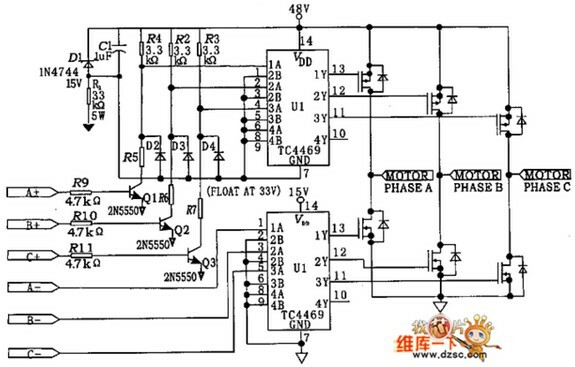 The load determines the current through the MOSFET. When the gate of IRF4905 voltage is 4v LOWER than rail voltage, the MOSFET turns ON. The 10k resistor on the base of the transistor is needed to prevent the base current exceeding the amount of current needed by the transistor to deliver current to the load. However the 10k resistor on the gate of the MOSFET is not needed. Providing the voltage (up to 18v) on the gate rises and falls quickly, the MOSFET will not get hot. The critical period of time is the 0v to 3v section of the waveform as this is when the MOSFET is turning on.